Emotional eating is when you turn to food for more than satisfying hunger. This is for when you need comfort or you are stressed. Perhaps you get a strong craving for your favorite junk food that you think is impossible to resist. This actually comes down to biology. Eating food high in sugar and fat releases dopamine which stimulates the pleasure center of the brain so you feel good but also makes you want to keep eating. But after you splurged on junk food, you do not feel good. In fact, you might even feel worse. The problems that made you eat emotionally are not solved and you feel guilty for binge eating. Depending on what you ate, you might also be feeling sluggish or even more depressed. Common comfort foods like ice cream and brownies are full of sugar that makes you fatigued and increases depression. Eating too much also might make you feel sick on top of being stressed or depressed. 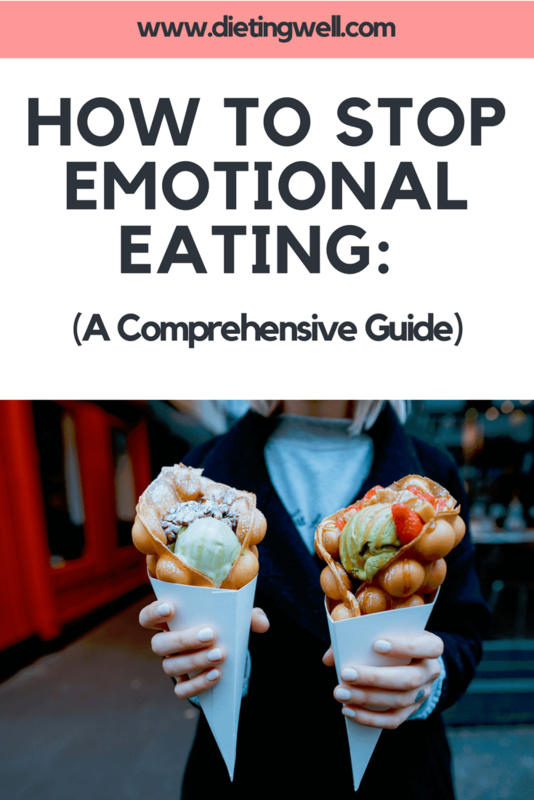 This guide will help you identify what emotional eating is as well as how to stop it in the future. Instead of being hungry in general, you want specific foods. Even if you are feeling hunger pangs, wanting specific foods is a craving to fulfill an emotional need, not real hunger. One way of seeing if you are really hungry or not is the broccoli test. When you start to feel hungry, ask yourself if you are so hungry, would you eat broccoli right now? If the answer is no, then you are not actually hungry and are instead acting on emotion. The hunger hits you suddenly, and demands instant satisfaction. Real hunger is more gradual and does not feel urgent unless you haven’t eaten in several hours. If you get a sudden, overwhelming feeling of hunger, then it is an emotional trigger, not a physical one. It is important to recognize the difference between the two to stop you from justifying emotional eating or questioning your body’s motives when you are truly hungry. You find yourself mindlessly eating. Have you ever looked down and suddenly realized you ate that whole bag of caramels or that whole bag of chips? This is a sign of emotional eating, especially when you pair eating with another activity, like stress-eating while working or comfort eating while watching TV. This is the most obvious signs you are feeling emotional cravings. Sometimes you can be stuffed but still want more. If that is the case, that is definitely an emotional feeling, not physical. Never eat when you’re already stuffed. 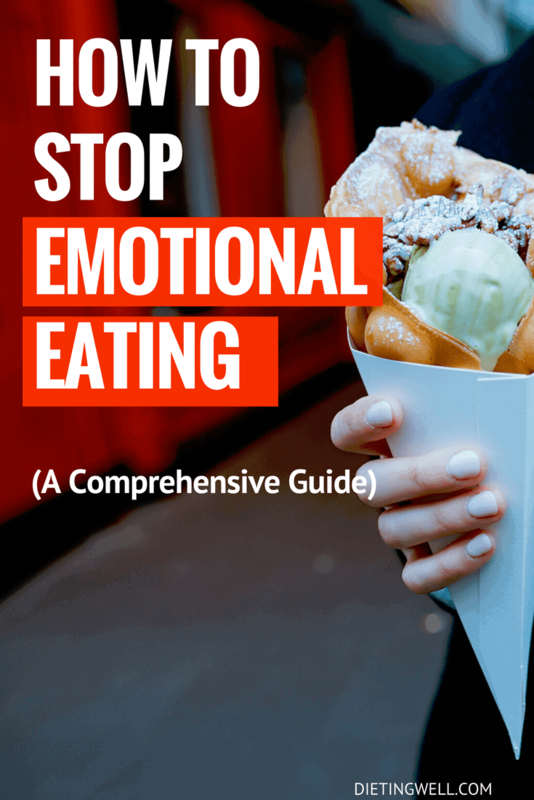 Is All Emotional Eating Bad? We can’t help but tie emotions to food. And not all emotional eating is bad. Getting some ice cream to celebrate, or going out for pizza with friends is emotional eating, but it isn’t bad emotional eating. The same can be said with rewarding yourself with a cheeseburger after cleaning out your closet. This isn’t bad as long as you see food as only part of feeling good and you don’t think it is necessary to feel good. Emotional eating becomes harmful when it becomes a coping mechanism for negative emotions. When your first impulse is to look in the fridge or dial for delivery when you’re bored, stressed, or sad, then it becomes a problem that needs addressing. Even worse, you are consuming a lot of unhealthy foods without really enjoying them. Your stress might be eased slightly for a few minutes, or depression might be numbed, but negative emotional eating does not bring actual pleasure and it will make you feel worse later because you feel like you have no willpower. Getting cravings when stressed isn’t all in your head. Stress, especially constant stress, leaves high amounts of the stress hormone cortisol in your system. Cortisol often makes you crave salty, sweet, and fried foods, or food that will give you a burst of energy. This makes sense because that burst of energy is supposed to help you get through whatever stress you’re feeling. But in today’s world it is easy to be under stress almost constantly. So eating junk food for short bursts of energy isn’t practical and is instead harmful. The more stressed you are, though, the more likely you will get these cravings. Also, vending machines and fast food places are usually close by and convenient. If you already feel like you do not have enough time in the day to do something, it might seem better to get a quick burger for lunch instead of finding a healthier alternative, or going to the vending machine for a candy bar to relieve stress instead of going for a walk. Whenever you are feeling uncomfortable emotions like sadness and depression, it is very tempting to numb it with food. It does not help that advertisements have been bombarding us our entire lives about how food can bring happiness or ease pain. Eating will temporarily take away the emotions but more often than not they come back after you stop eating. Have you ever eaten because you had nothing better to do? If you feel unfulfilled or bored then eating is a way to occupy yourself. It is a temporary distraction from the dullness of the moment or your dissatisfaction with life. When you were younger, your parents might have given you junk food after a bad day at school, an emotional eating habit that carries over into adulthood. Even childhood habits that are supposed to reinforce healthy eating can lead to emotional habits. Like being forced to vegetables even though you don’t want to can lead you to associate all vegetables cooked in all different styles with displeasure and even dread. Or being made to eat everything on your plate even if you are full could make you feel guilty when you can’t finish that huge buffalo wings platter you ordered and it might make you try to finish anyway. Other food could be associated with good memories, like baking cookies with your parents or having a backyard barbecue. These childhood habits can often carry into adulthood and evolve into harmful habits. Have you ever gone out with friends and started eating because everyone else was eating even though you hadn’t been hungry before? Maybe you’re at a party where you don’t know anyone and you stay near the snack table to look busy. Social influences often shape what we eat and we can end up emotionally eating because of it. When you are feeling negative emotions, stop yourself from going to eat first. Instead, do something else. If you’re feeling depressed or lonely, take a walk, put on your favorite song or call up an old friend for a chat. If you are stressed or anxious, go for a walk, drink some calming tea, or do some exercises to work off the nervous energy. Studies have shown that sipping a cup of black tea actually helps lower cortisol levels. And if you are bored, do something that you enjoy doing, whether that is hiking, or reading a good book. Or do something you always wanted to try, like pottery or knitting, or yoga. It is also important to identify the causes of your emotions so you can help yourself. Realize why you are stressed and why you are sad. Learning about the root causes of your emotions will let you better deal with them. Once you have solved or addressed your negative emotions, you will not have the impulse to emotionally eat. Mindful eating helps you get more aware of your eating habits. It allows you to pause after being triggered before you give into the habit. Not only will this stop you from overeating but it will allow you to feel good because you were able to overcome a craving. Instead of immediately satisfying your craving, wait for five minutes. During these five minutes, take a quick assessment of how you are feeling. After five minutes, if you are still craving the food, then eat it. It does not do any good to forbid yourself from eating it because forbidden food is much more tempting than all other food. Even if you end up eating after waiting five minutes, you will be more aware of eating and what you are feeling. Make a shopping list and stick to it Making a list will make you more aware of what you are buying. Take your time and make sure you are making healthy choices. When you are at the store, keep yourself from impulse buying. This reduces the availability of junk food at home which keeps you from emotional eating. Start with a small portion You can always get seconds and you might feel full after a small portion. Either way, having a few small portions instead of one big portion will make you more aware of how much food you are eating, and you will have to pause between portions, even if you only pause long enough to get more food. Use all of your senses throughout the meal Take in the aroma, the texture, and the taste as you eat. Listen to the crunch when you eat raw vegetables. Try to identify the individual seasonings while you eat. Paying attention to your food will allow you to enjoy it more and will leave you better satisfied with it. It will also keep you from mindlessly eating more than you meant to. Chew Thoroughly Chewing thoroughly instead of wolfing down the food can actually let you experience more flavors and enjoy your food more. By chewing thoroughly you also eat slower, which will allow you to get full and satisfied faster. Try practicing mindful eating for at least five minutes of every meal. It will make you more aware of the food you eat and you will be able to enjoy it more. Keep a Food Diary Write down what and how much you eat, as well as how you are feeling. By monitoring yourself and writing it down, you will automatically try to make better choices because you are more aware of your eating habits, but over time you will be able to see patterns and identify what triggers your emotional eating. Learn from Setbacks If you end up binge-eating one day, do not beat yourself up or think that you have failed. That just makes you feel bad which could trigger another binge-eating session. Instead, forgive yourself, start fresh the next day, and learn from the binge eat. What caused it? Are you going through a difficult time? Are you stressed? What alternative coping mechanisms can you use instead of food? Get a Support Group It can be really hard to break a habit on your own, but luckily you don’t have to. You are not alone in dealing with emotional eating. It is actually the number one reason people are overweight. Reach out to friends and family for help and support and join a support group with others dealing with emotional eating. You can even join a support group online if you cannot find one in your area. Talk to counselors and doctors as well for help. Sometimes everyone needs a little help and working with professionals and other people feeling the same thing could help you break your emotional eating habit and make you happier as well. Find Delicious and Healthy Alternatives Even if you are actually hungry, you are more likely to go for your favorite junk food instead of healthier options if those healthier options taste bland and boring. However, food does not have to be bland to be healthy. Look up recipes to find healthy food that tastes good. Try food from other cultures and experiment with spices and seasonings. Invite your friends over to try your creations as well. Tying good emotions and memories to healthy foods will make it easier for you to keep the junk out of the house because you will still enjoy healthier options. After a long day you will not be eating a piece of celery and wishing it was a candy bar. Instead you would be enjoying homemade hummus, or strawberries dipped in baking chocolate and you will not spend a lot of time thinking and craving junk food. When every bite feels a little clumsy, you become more aware of what you are eating and you cannot mindlessly eat without realizing it. Using your non-dominant hand forces you to concentrate on every bite. You could also eat your food with chopsticks if you never mastered using them, or use baby utensils. Breaking up the flow between hand to mouth will automatically make you more mindful about what you are eating and will allow you to get satisfied quicker. It is important to celebrate when you have successfully gone a week without emotional eating, or a month. Reward yourself with something fun, like a trip to the spa, some hiking, or just an evening curled up with a good book. Celebrating your success will make you want to continue your good habits and it will make it even easier in the future. As a side benefit, rewarding yourself can also relieve stress, boredom, or negative emotion, which means you will feel even less urges to emotionally eat for a little while. Just do not reward yourself with junk food, especially if you have not been craving it as much lately. The last thing you want to do is start up cravings for cheeseburgers again if all you’ve been craving recently is hearty vegetable soup. Emotional eating is a very harmful cycle, but it is possible to stop it. By choosing alternative ways to deal with feelings and being more mindful about your food, you will be able to reduce and even stop your emotional eating habit. Are you a stress eater? Let me know in the comments section below!